I'm a Belgian supermoto rider and I recently bought a FS650E form 2007.. It's my first berg so I hope I don't have to believe all those horror stories.. Right now I still use my 10,5l tank but that's way too much between my legs as I used to race 450's.. Is it only me or are they really that big? Now.. 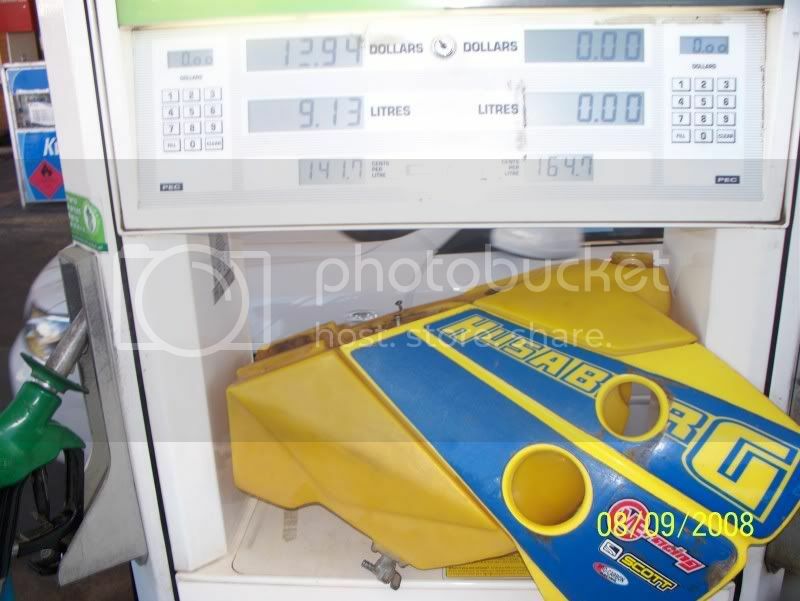 I've done a little search and from what I understand the plastic 7,5l tank is much narrower than a 10,5l tank, but not even close as narrow as an omero tank.. Right? I found a pic on the net of a berg with an even smaller tank.. Do you guys know what the fuel capacity is, where they are (if) available and if they feel as narrow or even more narrow than an omero? that'll probably be an omero tank. the radiator becomes the widest part so you only need it in SO far. the actual size of the tank is 9 litres for the std tank and that only came down recently to 7.5. It feels(almost)like a Dakar bike with the 10,5 liter tank mounted.It looks like a 5l tank from Omeromoto on your picture.I have the 7,2l(which actually holds about 6, on my 550 and itÃ‚Â´s a big difference compared to the stock tank. I run the omero tanks on all 3 of my bikes ( the one in your picture ) which dont hold much maybe less than 7L i think, weve added sections to one of mine wherever we could below and in the radiator gap and increased it to a bit over 9.5 and i use it for rallys and long rides in conjunction with the 3l sub tank. 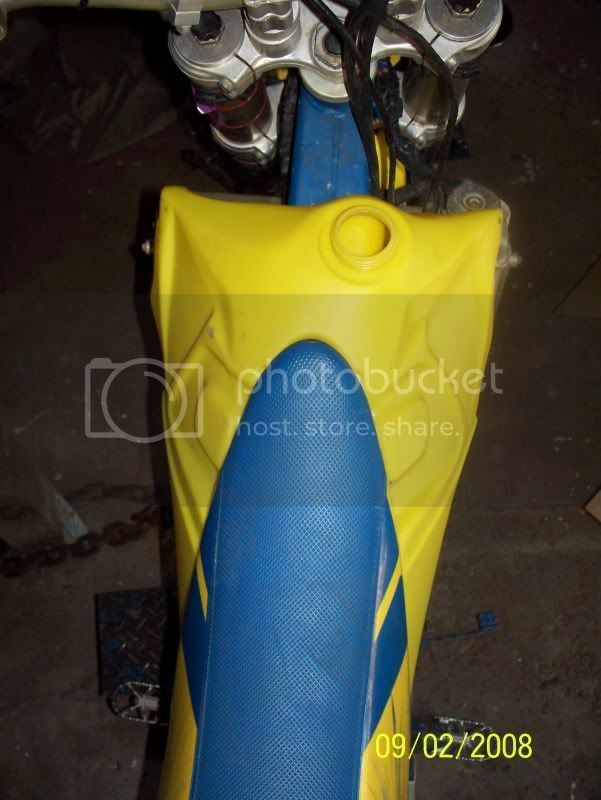 the omero feel like a 125 tank between your legs and side by side the plastic 7.5 Husaberg tank is wider. i can measure them for you if you want and get some photos of the modified one it looks great. adding more capacity to the alloy tank is easy if you have some alloy and someone to weld it. Flush the fuel out first or it might get a bit out of shape and turn into a rocket along with the guy welding it. The alloy tanks fit the bike ok but not the shrouds that well you will need a heat gun to reshape your shrouds, a knife to cut away some excess plastic, 2 cupped washers i use the ones from the berg front chainslider to mount the shroud, they offer a second threaded hole at top but i dont use it and you need a small holesaw to drill your shrouds to get access to front mounts. 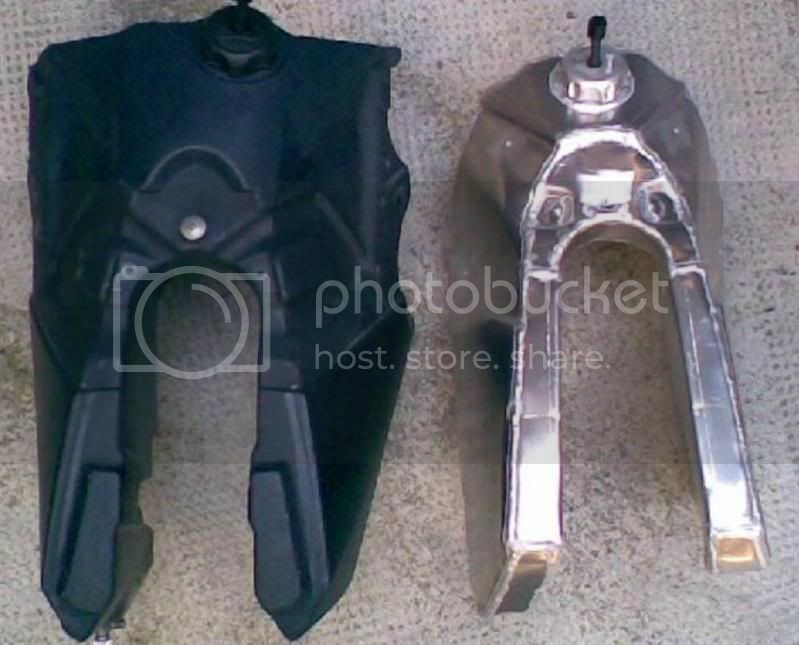 You will also need a bolt for the threaded hole to hold your seat down at the front, i machine up and run a thread on the broken ones from the KTM 50 or 65 sx tank after a parent has overtightened it and broken it. Thank you guys, that's the info I needed.. I really like the 5l tanks, but that might be a little small.. Does somebody have experience with this tank? There still one thing I don't get.. Taffy said: the radiator becomes the widest part so you only need it in SO far. He's right and my big 9l tank seems to be not wider than the radiator.. So how can other tanks feel slimmer? Because a lot of the riding time your legs(knees)will be positioned behind the radiator where the alloy tank is much slimmer than stock. Correct ive got rub marks from my knees on mine well back from the radiator on the narrow part of the tank, im about 5.8''. after using the alloy tank you would not ride with anything else but they are pricey and take a bit of time to fit. i had trouble getting the 7.5 plastic tank here in Australia i tried to order some but got the 10L instead as 7.5 the were only factory fitted as standard equipment on the Fe650 08 down here, i managed to swap a couple off new bikes as they wanted a Clarke 17l tank for long distance. i went through the same thing a while back.i compared the 7.5l plastic tank to my 9.5l std plastic tank & the difference is minimal. 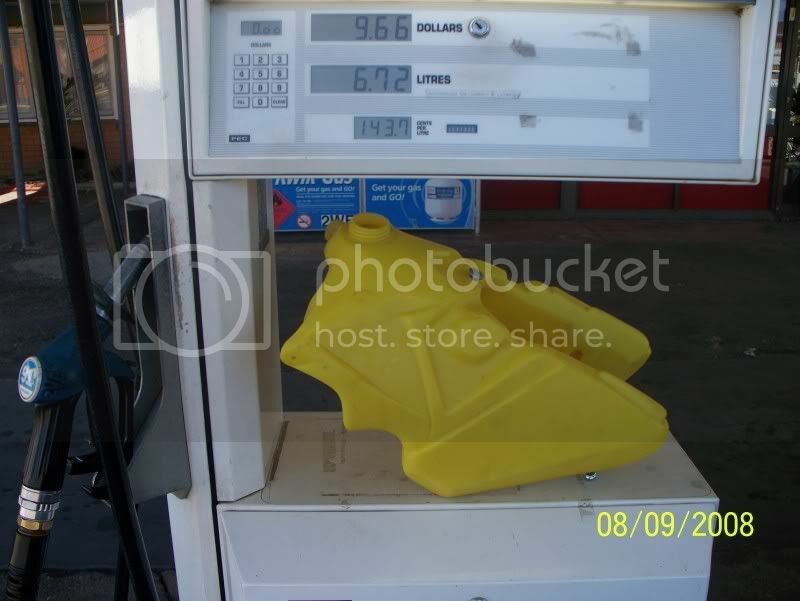 whoever designed that 7.5l plastic tank needs to be flogged with a gum stick,its a complete waste.everyone knows the bergs are too fat around the knees/inner thighs area & they still failed to address that. 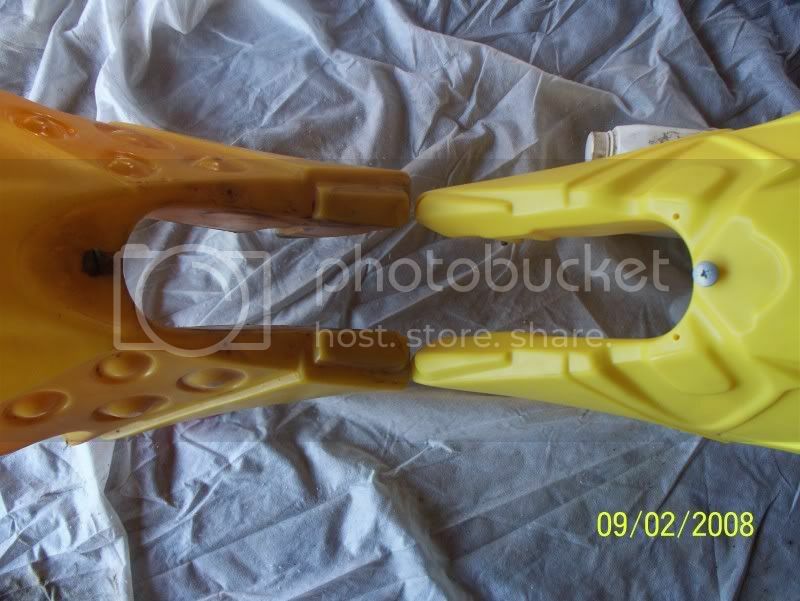 between the legs the 7.5l (which measures 6.7l actual)plastic tank is not any thinner than the 9.5l std tank. they took the extra fuel volume out of the front of the tank,there is just more gap between tank & radiator.the feel is the same. get the omero 5.5l or 7.5l alloy tank,there is no comparision.i also run the under seat fuel cell (3.0l in volume)with the omero 7.5l alloy tank (with is acually 7.2l) which takes it to 10.2l total. i'm about 6ft tall & my knees only come within 3-4 inches behind the radiator,they sit pretty much in that lower hole in the plastic shroud,so unless you are over 7ft tall the radiator isn't a issue. these pics don't really show justice of the alloy tank, but is better than nothing. after riding wal's fe550 with the std tank i couldn't believe(or remember) how big they really were with the std set up.the difference is big. 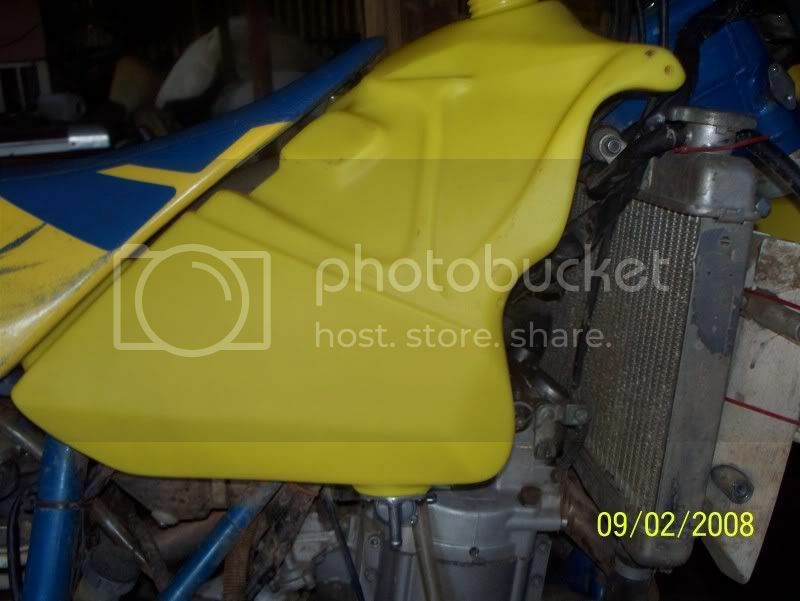 if you are use to riding a tt600 or an xr600 the std plastic one will feel ok,but if you are use to riding a jap 450,the std berg tank will feel like a monster. i think your pictures have sold the story well, unless your blind or been drinking to much rum with Wal. Thank you very much.. The pictures make it clear indeed! 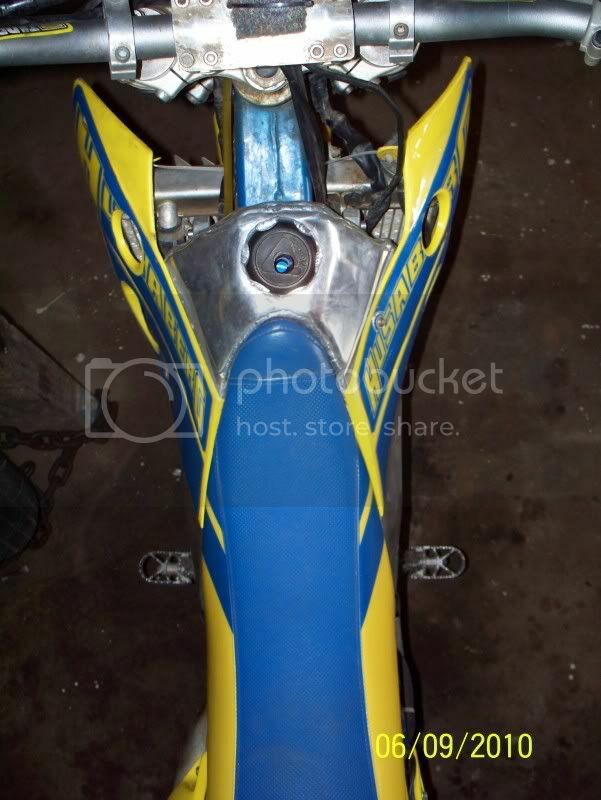 I'm defenitly going to order an alloy tank, just not sure which one.. I really like the 5,5l and I guess it's ok for racing but maybe it's too small when I'm out on the streets..